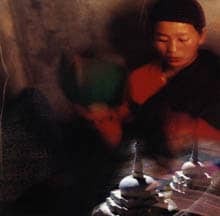 At the heart of Tibetan Buddhism is a unique combination of altruism and indestructible self-confidence, and this union is clearly embodied in the religious songs and music of its practitioners. For Choying Drolma and the nuns of Nagi Gompa, a Buddhist nunnery in the foothills of the Himalayas, the songs they sing have been passed down in an unbroken living tradition for hundreds of years. In 1994, guitarist Steve Tibbetts visited their remote monastery to record their music, which he later framed with elegant and restrained arrangements to create the stunning collaboration that is Chö, newly released on Hannibal Records. Embodying the meditative qualities of the more familiar Gregorian chants, the nuns’ otherworldly voices strike the heart and soul with a transcendent beauty that could convince even the most cynical listener of the oneness of the universe. “I work occasionally for the Naropa Institute’s study abroad programs in Bali and Nepal. Some of the students were studying at a small monastery at Pharping in the southern part of the Kathmandu valley (Nepal) in 1993 and I stayed there nights to make sure they were greeted, fed, and seen off each day. One of the translators (Andreas) came up to the roof to find me one evening saying, ‘You should really come and record this nun singing in the shrine room.’ I came down, set up my portable tape recorder, and was so entranced by the sound I was hearing I forgot to take the tape deck off ‘pause.’ Luckily, the translator was also recording and lent me his tape to take home. “I came back to do the same job the next year and brought a DAT recorder and two mics to do a proper recording session. This time the nuns were up at Nagi Gompa, a small nunnery in the foothills above Kathmandu. I asked Andreas what I could bring them from town and he suggested Cokes, candies, and cookies. The nuns were happy. They crinkled the candy wrappers, chugged the cokes down, and burped during the session. Tibbetts’ musical colleague in Chö, Choying Drolma, was born in Kathmandu in 1971 to Tibetan exiles who fled the Cultural Revolution (and their homeland) in 1959. At the age of twelve, Choying asked her father to allow her to pursue the monastic life. Choying’s uncle, a Buddhist teacher living in New York, recommended the Nagi Gompa nunnery, where she was accepted as a nun and student under the tutelage of Lama Tulku Urgyen Rinpoche, one of the greatest teachers of nonconceptual meditation and a resident of the nunnery for 34 years. Up until his death in 1996, Rinpoche instructed Choying in monastic rituals and meditation and taught her many of the chants and feast songs which appear on this recording. His wife, Kunzang Dechen, was also considered one of the great practitioners of her time, founding many temples and retreat centers in Nepal and encouraging women in particular to involve themselves in spiritual practice. Chö (meaning “cutting”) is the contemplative system of Tibetan Buddhism practiced by Choying and her colleagues. It involves the yogi or yogini mentally offering his or her own body as a means of severing attachment, literally “cutting through ego-clinging and the traditional four demons.” The training is based on the tradition of Prajnaparamita (transcendent knowledge) in which the practitioner sees through the illusion of a solid reality by recognizing the insubstantial nature of all things. The religious songs that accompany this tradition have been passed from accomplished masters to worthy students for hundreds of years. Tibetans do not regard this music as folk music, but rather perceive the depth of meaning in these songs as capable of enhancing understanding and transforming ordinary experience. Among the songs represented on Chö are termas (spiritual treasures brought back from celestial realms by enlightened teachers), spontaneous songs of realization that sprang forth as creative expression from aware, perceptive individuals, and chants composed for contemplative practice. Representative of Chö’s meditative aspect is “Calling Upon The Masters Of The Chö Lineage” (“Ney Ogmin Choying Podrang”) in which the supplicant asks for assistance from the great Mother, the Buddha, the Lady Tara and others. After invoking them one by one, each verse ends with a common request: “Grant me the supreme and common accomplishments, guide your child on to the state of nonarising. ” In the “Feast Song By Jigmey Lingpa” (“Leymon Tendrel”), the mood is celebratory and extroverted: “Turn your tail parasol to face the sacred teachings, So we youngsters can also step onto the path of freedom.” Each jewel-like piece shines brightly in Tibbetts’ refined musical settings. His use of instrumentation, including guitar, bozouki, cello, viol da gamba, violin, bass, and percussion, enhances but never overwhelms the intrinsic nature of the songs. In addition to her more serious pursuits, Choying enjoys a wide variety of Western music and numbers Whitney Houston and Tracy Chapman among her favorite singers. Proceeds from the sales of Chö will go to support more secular concerns; first on the list is the purchase of a solar heating system for Nagi Gompa’s water supply.